The New Teen Titans#26 p. 16 was penciled by the great George Perez and was inked by Romeo Tanghal featuring RAVEN & CYBORG helping a runner for the Drug Dealer. Another spectacular showing of good storytelling and smooth penciling. George is a master of these crafts and it shows in this vintage page... A Bronze Age 1982 oldies but goodies! 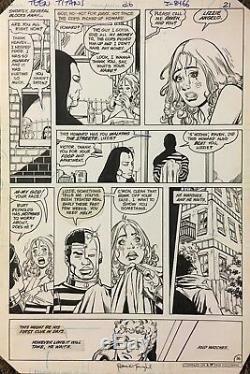 The item "Comic Art OriginalThe New Teen Titans#26 p. 16-GeorgePerez & RomeoTanghal" is in sale since Monday, February 4, 2019. This item is in the category "Collectibles\Comics\Original Comic Art\Interior Pages". The seller is "rome-tangh" and is located in Somerset, New Jersey. This item can be shipped to United States, Canada, United Kingdom, Denmark, Romania, Slovakia, Bulgaria, Czech republic, Finland, Hungary, Latvia, Lithuania, Malta, Estonia, Australia, Greece, Portugal, Cyprus, Slovenia, Japan, China, Sweden, South Korea, Indonesia, Taiwan, South africa, Thailand, Belgium, France, Hong Kong, Ireland, Netherlands, Poland, Spain, Italy, Germany, Austria, Bahamas, Israel, Mexico, New Zealand, Singapore, Switzerland, Norway, Saudi arabia, Ukraine, United arab emirates, Qatar, Kuwait, Bahrain, Croatia, Malaysia, Brazil, Chile, Colombia, Costa rica, Panama, Trinidad and tobago, Guatemala, El salvador, Honduras, Jamaica, Viet nam, Uruguay.